Cream the butter and 1/2 cup sugar in the bowl of an electric mixer fitted with the paddle attachment. In a separate bowl, combine the 2 cups flour and salt. Then, with the mixer on low, spoon flour and salt mixture into the electric mixer with the butter and sugar until just mixed. Remove the dough and place into a 9 X 13 X 2-inch baking pan. Flatten and press the dough, evenly, into the baking pan, building up a 1/2-inch edge on all sides. Chill in the refrigerator. Remove dough from fridge and bake the crust for 15 to 20 minutes, or until very lightly browned. Let cool on a wire rack. Whisk together the eggs, 3 cups sugar, Meyer lemon zest, Meyer lemon juice, and 1 cup flour. Pour mixture over the crust and bake for 30 to 35 minutes, or until the filling is set. Remove from oven and let cool to room temperature. 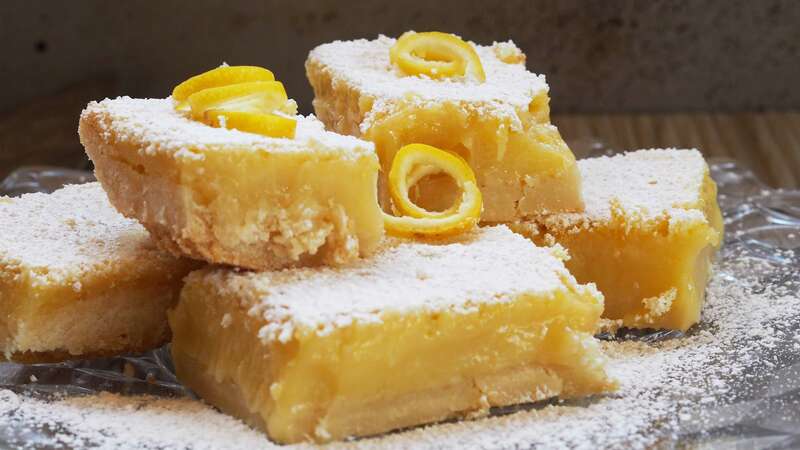 To serve, cut into squares and dust with powdered sugar.